After escaping an abusive marriage, Matilda finds herself living on the streets. There she finds a family worth fighting for. 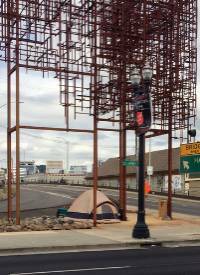 Set in a Portland homeless camp. This is a staged workshop of a new musical about struggle and hope. Book, music and lyrics by Alan Alexander III. Additional music & lyrics by Kathryn Grimm. Starring: Barbara Passolt, Bruce Jennings, Sami Yacob-Andrus, Myles Lawrence, Lindsay Reed, Kyle Urban. The 'Homeless' Orchestra is: Steve Cleveland-piano, Kathryn Grimm-guitar, Leah Hinchcliff-bass, Edwin Coleman III-drums. Sponsored in part through a generous grant from the Regional Arts and Culture Council.